Street lights need adjustment. The lights take too long to change. Drivers are becoming increasingly impatient. If you have any questions please give me a call directly at 909-824-6621 ext. 255, thank you. The City is discontinuing the use of the reporting platform SeeClickFix and it will take effect on January, 2019. Civic Live, is the new platform that allows residents to document neighborhood concerns and improvements alike, litter and inoperative vehicles. Thank you, for you're patience and cooperation. In the pump station at the end of Rene Lane, behind the locked fence, there are many huge tumbleweeds and other weeds. Recently, there has also been a homeless individual within the walled area of the pump station. The weeds, in addition to being unsightly, make it difficult to see what is going on back there. Again tonight, a homeless individual has been in or right near the pump station, yelling throughout the night. Previously, when the police were called regarding the irate, screaming homeless man, they were unable to see into the pump station because of the current overgrowth of tumbleweeds and bushes. Thank you for your submission issue has been reported to Code Enforcement and will be handle in the order received. If you have any further questions please contact 909-824-6621 ext. 217. Code Enforcement has gone out there to inspect the property and has not seen any homelessness. If you do see individuals please do not hesitate to contact the San Bernardino Sheriffs at 909-387-8313. We are working to have the neighboring property maintain their overgrown vegetation. This property was owned by a doctor who passed some months ago. My understanding is that maybe a son owns it, but any event, it has become an eyesore . The weeds on high in the front and back, and the fence is broken all down from the front to the back yard. This needs to be cleaned up before it gets dry and the weeds catch on fire in the summer. It is making our neighborhood look back. Thank you and I would appreciate to know what is going to be done. That's from the home owner rinsing his driveway down instead of sweeping it like they should have. Water is constantly flowing down Holly to Brentwood and then Brentwood to Mt Vernon. It causes weeds to grow between the curb and street and in the joints of the curb. 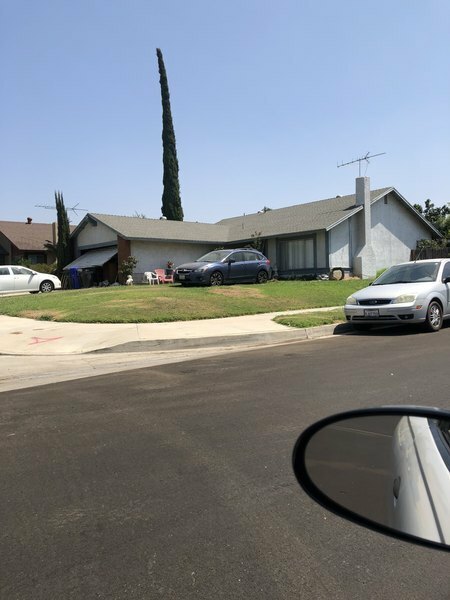 It is particularly annoying for neighbors who do not squander water resources on lawn or excessive watering to have the City not maintain the weeds in the street or site the constant water flow in the curb. The task being left for the down hill property owners for the is to remove the weeds and muck into the road to dry and then shovel it into a trash can for removal. This is City Property, that should be maintained by the City according to the Codes and Sweeping Laws. Secondary problem the curb has raised spots and the constant flow of water creates pools for mosquito to breed and live. No amount of weed abatement by homeowners will correct the ever wet pool of water caused by raised curbs. Please find the source of the constant or nearly constant flow of water and have it corrected so the curbs can dry out. It's not like it is actually raining. Water conservation is a CITY and Water Company Issue. Correcting where water pools is the CITY's Responsibility. Fixing the Pothole at the Alley and Brentwood is the City's Obligation. The constant flow of water degrades the road way as well.. The tree has not been trimmed in approximately twelve years. The dead branches are hanging approximately fifteen feet from the top of the tree and we are concerned if the tree caught on fire it would jeopardize are Homs near the tree. As home owners we are told by the county every year to clear all are over grown trees and weeds. If that tree were to catch on fire it do a lot of damage. Thank you for your submission issue has been reported to Code Enforcement we are having difficulty locating the tree you are trying to identify. Is there a nearby address that you may be able to provide? If you have any further questions please contact 909-824-6621 ext. 217. The tree is behind 23020 Merle ct. Victoria is a private drive off Barton rd between Preston and Honey Hills on the south side of Barton rd. If you need me to take another picture let me know. Thank you for your response. Overgrown bushes, trash and boxes in front, garage door being held up by trash cans. Absolutely a hoarder and disgusting to this neighborhood!!!!! The hoarding has moved to the outside. Please help!!! Thank you for your submission issue has been reported to the Code Enforcement Department and will be handle in the order received. If you have any further questions please contact 909-824-6621 ext. 217. There was a man with a bat who entered the pool area and used the facilities to "bathe" looking at cars and walking aggressively up and down w his bat. I've already had 2 tires flattened in the parking lot of the Lido. He does not live here and should not be on the property. He is Mexican not that tall maybe 5'9-5'10 but overweight. A noticeable cleft pallet. Very unattractive guy. I definitely would have noticed him if he lived here.